Perhaps the most controversial famous leader among the Hunkpapa and indeed, throughout the world is Sitting Bull. Sitting Bull was born on the Grand River in 1834. As a youth, historical accounts assert that Sitting Bull was already a deep thinker and a strong warrior. Throughout most of his life Sitting Bull strongly protested against any cessions of Indian land and opposed the confinement of the reservations. Sitting Bull, Tatanka Iyotake, was known best for his part in the Battle of the Little Bighorn. Before the battle, Sitting Bull had a vision of soldiers falling into camp. This vision reinforced the belief in the strength of Sitting Bull’s medicine. After Sitting Bull’s participation in the Custer battle the army pursued Sitting Bull, and early in 1877 the old Sioux medicine man and many of his followers fled to Canada. Sitting BullIn July 1881, Sitting Bull and his followers surrendered to the United States Army at Fort Buford, North Dakota near Williston. Unwilling to compromise with the whites and become a reservation Indian, he was sent to Fort Randall, South Dakota for two years. In 1883, he returned to Standing Rock. It was during this time that he became a public figure speaking for Indian people. Many of his quotes and statements are used today. He traveled with the Buffalo Bill Wild West Show. Sitting Bull was commended by Indians and non-Indians alike for his generosity and his concern for people. He was often seen giving money to the street people of the cities he visited. He once commented that he could not understand how there could be so much poverty in the midst of such wealth. Sitting Bull kept out of serious trouble until 1890. The Messiah Craze Ghost Dance had come into Indian country on most of the Sioux reservation in South Dakota. In the fall of 1890 the new religion came to Standing Rock and it was believed Sitting Bull was a supporter of the Ghost Dance. On December 15, 1890, Sitting Bull and seven of his followers were killed as well as six Indian police. The killing of Sitting Bull was one of the events, which led directly to the incident at Wounded Knee. Upon the death of Sitting Bull he was buried near the military cemetery in Fort Yates, North Dakota where a small monument marks his original grave site. In 1953, it is said, that his remains were moved to a burial site near Mobridge, South Dakota. This grave is located South of the Grand River Casino where a large monument has been created as his memorial. Today, the tribal college at Standing Rock has been renamed in his honor as Sitting Bull College. 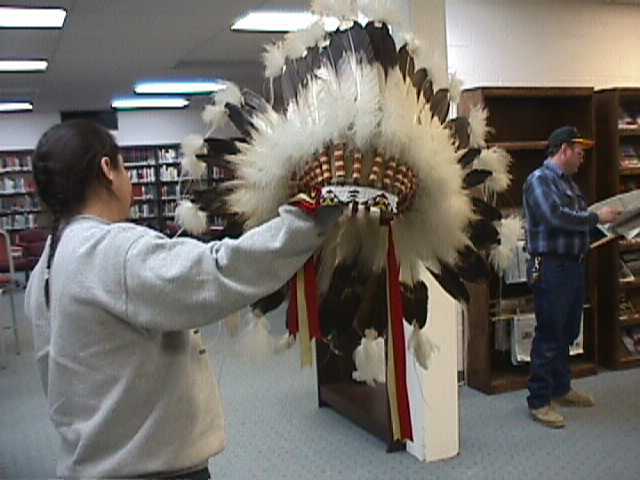 The College has one of Sitting Bull’s war bonnets on display in the Presidents office, believed to be at least 130 years old.